Beech Mountain Winterfest Beer Festival Today! Beech Mountain Resort’s Village Shops offer the best “feel” of all of the resorts in North Carolina. The Village includes the View Haus Cafeteria, Ski Rental Shop, Snowsport Learning Center, Youth Learning Center, Beech Village Gifts, Ski Beech Sports Shop, Demo Center, Ski Repair, Beech Tree Restaurant, The Red Baron Room, Snowboard Rentals and more! Beech also features a 7,000-square-foot outdoor ice skating rink with the best atmosphere in the region. The rink is located right in the middle of the Beech Tree Village and offers a perfect way to round out your winter vacation. If you like sledding, you will love tubing! Beech Mountain Resort constructed a new, state-of-the-art tubing park adjacent to the Alpine Village at the base of the slopes. It’s a great location that provides for extra long tubing runs, and offers convenient access to ice skating, shopping and dining in the Alpine Village. With chutes up to 700 feet in length, all ages can enjoy an exhilarating ride. Our tubing area is serviced by a magic carpet conveyer, which transports riders quickly to the top! Tickets are sold on a first come and first serve basis. Sessions are 1 hour and 45 minutes long. Prefer to stick with sledding? 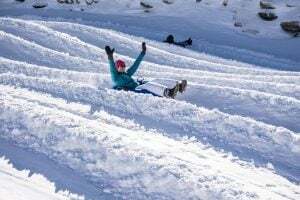 The popular youth sledding hill in the Town of Beech Mountain is open daily from early December through mid March. The hill provides free sledding for children 12 and under. The sledding hill is located next to the Visitors Center/Chamber of Commerce on Beech Mountain Parkway in the heart of Beech Mountain. For 2016, Beech Mountain Resort is set to unveil a new terrain park this winter. Aptly named The Park, the newly-constructed facility is the largest terrain park in resort history. It caters to riders with rotating freestyle features, a dedicated snowmaking system, new light towers, and a surface tow lift providing top-notch conditions in the park day and night. The Park, which has more than 50 features in its inventory, now has more acreage to build more elaborate jumps and features. As an added bonus, relocating the park away from the Powder Bowl slope recaptures prime terrain for skiers. For the last seven years, the terrain park’s location on the Powder Bowl slope limited the amount of skier traffic that section could handle. Powder Bowl will now re-open as skiable terrain with a blue square designation. There are a number of hotels in the town of Beech Mountain as well as the surrounding area. Looking for something more private? There are 650 ski chalets located on and around the resort area of Beech Mountain NC, and there are several stay and ski packages.